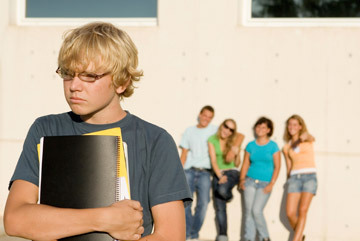 A new study (discussed here) reports that 46% of autistic teens and pre-teens are bullied. This is almost 5 times higher than the national average of typically developing children who fall victim to bullying. Plus, the study indicates that higher functioning kids on the spectrum are targeted more than severely disabled kids. I guess it makes sense…people, even kids and teens, usually have compassion for those who are clearly disabled. They “feel bad” for the person, and they know it’s wrong to make fun of them. But the kid who walks and talks and goes to the same classes and plays the same sports….well when that kid does something unusual, he’s just a weirdo. It’s almost as though the more a person fits in, the more they stand out. High-functioning autistic kids are on a level playing field with their non-autistic counterparts in so many areas. So the areas they may not be up to par tend to be more noticeable (difficulty with conversation, understanding sarcasm, jokes, or social cues, difficulty relating to others emotions, etc). So why is this happening? And how can we stop it? Well this is where education comes in. Educating kids about diversity, and compassion, and inclusion. Educating kids on disabilities and how they can be part of the solution instead of part of the problem. It’s so important to empower children and teens, and to encourage loving relationships with people, even if they’re different. And besides, once someone opens up to an autistic peer, they might just realize what a great person he or she is! And most of all, I want to impress that these beliefs and attitudes start at home. If parents foster an appreciation for diversity, rather than make it something scary or bad or wrong, their children are more likely to follow suit.